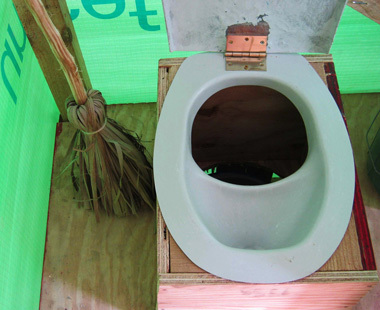 Achieving dramatic change in Haiti with composting toilets. SOIL (Sustainable Organic Integrated Livelihoods) is an amazing non-profit organization in Haiti building urine diverting composting toilets. SOIL has developed an innovative solution for managing human waste in that impoverished nation. Haiti has no sanitary sewers or septic fields. In the main city, Port-au-Prince, sewage is picked up and trucked to the city landfill, and there it just dumped out on the ground. Elsewhere is often gets dumped in any convenient ditch. Cholera and other sewage related health problems are rampant. You can watch a short video on SOIL below. SOIL has developed a practical, low cost method of dealing with this difficult problem. Their mission is to “protect soil resources, empower communities and transform wastes into resources in Haiti.” Essentially, they collect the human waste, and rather then dumping it, they compost and recycle the material for use in agriculture and reforestation. The heart of the EcoSan system is the urine diverting toilet, which separates the urine from the feces in the bowl. This makes it much easier to manage the waste. Urine is sterile, and can either be diluted and used as fertilizer, or sent to a simple drain pit to percolate harmlessly into the ground. Urine diverting toilets drastically reduce odor as well, compared with other composting toilet systems. It is the combination of urine and feces that creates that astonishingly bad smell we associate with outhouses and portable toilets. Separating urine from solids practically eliminates that. These toilets are not unpleasant to use. In Haiti, SOIL builds these urine diverting toilets from locally sourced materials. They are not expensive – a communal toilet for up to 5 families costs US $150, while an individual household toilet is US $60. (Compare this to the winning toilet design from the recent Bill Gates competition – at $1,000 per unit!). SOIL collects the waste material from the toilets. They pick up full 15 gallon waste drums, and replace them with empty ones. The waste is then composted according to World Health Organization guidelines. It is mixed with and covered by a sugar cane byproduct in large bins. Surprisingly, there are no flies and no odors, despite the humid, tropical conditions. 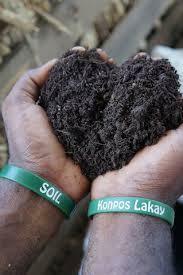 After 6 months, the fully composted material can be sold, or used as fertilizer. The project is a huge success, with over 20,000 people using these the EcoSan toilets. Requests for new toilets are coming in faster than they can be built. By any measure, the project is a major success, safely treating sewage, producing much needed fertilizer, and creating new jobs. The SOIL model is a simple, elegant solution to the difficult problem of managing human waste that could work all over the world. Read more about the great work SOIL does here.